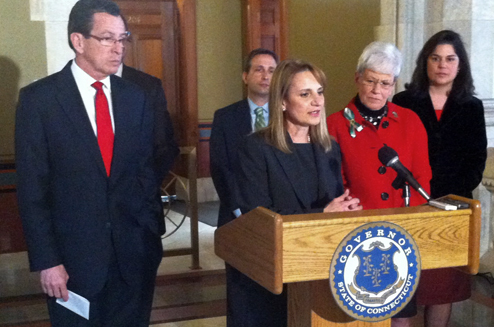 On February 14, 2013, Governor Dannel P. Malloy (left) appointed Evonne Klein (at lectern) as the first commissioner of Connecticut’s new Department of Housing. Lieutenant Governor Nancy Wyman (right of Klein) looks on. Image courtesy of Office of Governor Dannel P. Malloy. Creating a singular vision for housing policy in a state such as Connecticut, which encompasses both industrial towns with high levels of poverty and some of the wealthiest suburbs in the country, is a formidable task. Exacerbating this difficulty, Connecticut has not had a single state agency dedicated to housing for nearly 20 years. During this period, responsibility for state housing programs was spread among multiple agencies — the Department of Economic and Community Development, Department of Social Services, Office of Policy and Management, and Department of Mental Health and Addiction Services. Connecticut policymakers hope to more effectively address the state’s housing needs by reorganizing and consolidating these programs into a single department. In 2012, Connecticut’s state legislature authorized a new Department of Housing (DOH) to serve as the lead agency for all housing initiatives. Public Act 12-1 also created the Interagency Council on Affordable Housing to recommend policy priorities for the new department and determine which housing-related programs would be transferred from other state agencies. The Interagency Council’s report found that the state’s divided responsibility for housing programs forced clients and partners to visit multiple departments to locate housing data, existing facilities and services, and offices where new programs were being considered. Agency responsibilities for housing production, operation, and financing were uncoordinated and often duplicated. This fractured organizational structure encouraged agencies to focus only on their own limited perspectives and narrow interests; no unified voice existed that could promote affordable housing and highlight its relation to economic development and other state goals. To remedy these deficiencies, in January 2013 the Council recommended that 69 housing services and funding programs in 4 agencies be centralized in the new DOH. The state senate approved Evonne M. Klein as the first commissioner of DOH in March 2013, and staff and programs were consolidated in the new department by July 1. The state’s 2014–15 budget provides DOH with more than $220 million for affordable housing construction and programs. Housing affordability was a major focus of the Council’s work. Although socioeconomic conditions vary widely in Connecticut’s municipalities, the need to preserve housing affordability affects most of them. In 137 of the state’s 169 municipalities, less than 10 percent of the housing stock is affordable (defined as deed restricted to preserve affordability, financed by a Connecticut Housing Finance Authority mortgage, or government subsidized). More than half of all Connecticut renters pay more than 30 percent of their income for housing; the state’s overall housing costs are among the highest in the nation for both renters and owners. Despite the apparent need to increase the housing supply, Connecticut’s housing construction per capita has been lower than that of most states. The state’s Consolidated Plan for Housing and Community Development cites housing as a major economic development challenge, noting that the lack of affordable housing has discouraged workers from moving into the state and encouraged young adult residents to live elsewhere With fewer new households being created, current homeowners are left to absorb any increased state and local property taxes. According to Nick Lundgren, formerly director of the Office of Housing and Community Development within the Department of Economic and Community Development and currently a director in DOH, “[T]here is definitely a growing consensus that affordable housing is a necessary component of the state’s efforts to revitalize communities and ensure that the state is economically competitive.” Locating housing close to transit and employment centers is a departure from the state’s previous practices, which often relegated affordable housing to undesirable locations. “Connecticut’s approach to affordable housing today is to prioritize housing that is in locations that connect residents with opportunities,” says Lundgren. Policymakers also see the need to diversify the housing stock to satisfy residents from multiple demographics with diverse resources and tastes. The Interagency Council identified as priorities housing for the state’s elderly, homeless, very-low income, and workforce populations, as well as affordable housing near transit, in downtowns, and outside of poverty areas. Lundgren notes that local municipal officials are increasingly looking for ways to retain both highly educated young workers and their parents, who may be looking for downsized housing in their current communities. The Interagency Council’s report provides a strategy for reorganizing Connecticut’s housing policy and programs, with high expectations on many fronts for DOH. The report calls on the department to ensure affordable housing for seniors and young workers in addition to providing housing and services for homeless and low-income people. DOH is challenged to do this efficiently, stretching tax dollars and minimizing bureaucracy for residents and developers. The report recommends that the department collaborate with other state agencies to provide housing in walkable neighborhoods and near transit, reducing pollution and easing traffic congestion while building strong communities. The Council notes DOH will have to convince others that affordable housing is essential if Connecticut’s economy is to grow, that strong businesses rely on well housed workers. The Council’s report has set out a unified strategy to address these housing challenges, and Commissioner Klein and DOH staff are organizing now to provide the response.